Are you current or retired state employee? Do you know about Washington State's Combined Fund Drive giving program? Garfield Elementary PTA is now a registered charity for the CFD. Our charity code is 1481897. You can sign-up by clicking on the image. Do you dine at Red Robin? If you join their Royalty program, every time you eat there, Garfield could earn a donation of 1% of your total purchase. Click on the image to learn more! Now you can link your Fred Meyer card to Garfield Elementary and earn cash back for the school. Just click on the community rewards logo to go to their website. From there, choose the "Link My Rewards Card Now". Make sure you use the NPO #88694 to find us! Even if you don't have a Fred Meyer card yet, by following this link you can create an account and receive one electronically. Collecting Box Tops for Education decals is one way the Garfield PTA fundraises for our programs and events. So clip those Box Tops on your boxes of cereal, granola bars, and lunch box goodies (make sure they haven't expired). For more information, a list of participating products, and additional earning opportunities, click on the box top image. If you have a Target Red Card, you can designate Garfield Elementary as a beneficiary. 1% of your purchases will be donated back to our school. Click on the image to enroll or learn more. Another great option is to participate in the 1% Community Rewards program through Ralph's and Bayview Thiftway. If you have a ThrifteCard that you use at either of these locally-owned Thirftway stores you can register it by calling 360-596-0110. 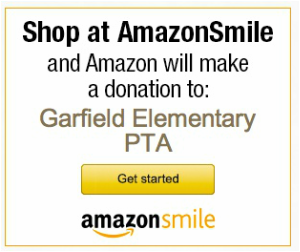 Leave your name, phone number and tell them your supporting Garfield PTA #1076. They give Garfield back 1% of all purchases. If you like to sign up for a ThrifteCard, click on the picture to download the form. Every Friday during first through fifth grade lunch recesses the PTA sells popcorn for 50 cents a bag. And, remember, every completed boxtop sheet turned in on Friday at lunch earns you a FREE bag of popcorn. Register at https://secure.escrip.com/supporter/registration/index.jsp, and shop through their online mall to redirect a percentage of your purchase back to the school. The Online Store includes special pricing from companies such as Home Depot, Macy's, Apple, and many more.